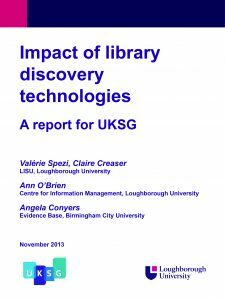 Back in 2013 LISU was commissioned by UKSG, in collaboration with Jisc, to investigate the impact of Web-scale discovery systems (WDS) on the usage of academic resources in the context of UK higher education information services. The focus of the project was to provide an evaluation of the impact of WDS on content usage, as well as to provide a series of recommendations for the various stakeholders in the information supply chain – e.g. publishers, content aggregators, information services, national and international bodies and associations – to best support the discovery of information resources in the higher education context. The report was released in December 2013 and is freely available (click on the image below). Often, the research cycle stops here, with the delivery of the research report – and with the writing of subsequent academic articles based on the research findings. Rarely, the researcher gets involved in the ‘what next’ questions, such as who, other than their peers, is going to read the report or journal article; whether the findings are going to be promoted to practitioners and other stakeholder groups; how the findings are going to be used; how the recommendations are going to be followed up; by whom etc. In other words, researchers do not know what happens next, beyond simple citation counts. For those of us who went through the painstaking task of writing impact case studies for the 2014 Research Excellence Framework (REF), we all recognize now that it has been a painful process to acknowledge that we often did not know – or even care – about the ‘what next’ questions and how our academic research was used in the ‘real’ world. Researchers’ attitudes were often along the lines of, the work is now done and dusted, let’s move on to a new research project. The REF actually made us more aware of the need to reflect on the impact of our research – because of course we want to be cited for our contribution to a research field, but we also want to make a difference, within and beyond academia. We were then invited to take part in a Webinar in May 2014 to discuss further the findings and recommendations. This was another opportunity to reach out to a great variety of information professionals, including publishers, system vendors and librarians, who had not been able to attend the UKSG conference. It is worth noting that there was a strong interest in our research from information professionals in the US, based on both the registration forms collected and the questions asked during the Webinar. Participants were particularly interested in knowing more about issues surrounding RDS index coverage and neutrality of RDS systems, as well as understanding better the impact of RDS systems on library systems such as online catalogue (OPAC) or Library Management Systems (LMS). They also raised the all-important issue of students’ and researchers’ information behaviours – which we did not explore in our study as this was well beyond the scope of our research. In our opinion, this is a very sensible issue to raise: why build up systems to bring students and researchers back to the virtual library when we know this is not where they start their information search journey. In other words, is it worth bringing users back to the library – albeit the virtual library – when the technology to bring library information to users via search engines is there. Can web-scale discovery tools lure students away from Google? Are we right to want to change ingrained user behaviours? This is something we would like to follow up in the future. This is actually an example of a somewhat rare opportunity for researchers to actually take part in the aforementioned ‘what next’ phase. Not only had we produced a very well received report, but we were also asked to contribute to the debate and subsequent developments, and to reflect on how those recommendations we provided could be taken further. UKSG and Jisc are planning a joint event to take the recommendations forward in September, and we will follow this closely. Watch this space!